By Chris Williams: It’s now been confirmed that WBO welterweight champion Tim Bradley (31-0, 12 KO’s) had to extend his contract with Top Rank in order to get the rematch with Manny Pacquiao (55-5-2, 38 KO’s) on April 12th, according to Dan Rafael of ESPN. It’s unknown for how many fights/years that Bradley had to re-sign with Top Rank to get the fight, but even if it’s one year, it’s going to likely finish any chance that Bradley had of getting a big money fight against Floyd Mayweather Jr. Say what you want about Bob Arum of Top Rank, but he was pretty clever to get Bradley to re-sign for the Pacquiao fight given that Arum needed Bradley more than he needed him. If Bradley had stuck to his guns and refused to re-sign with Top Rank, he’d have likely gotten the rematch with Pacquiao anyway, as they didn’t have anyone else to put in with Pacquiao other than Ruslan Provodnikov, and that’s no choice. By extending his contract with Top Rank, Bradley will likely face Juan Manuel Marquez in his next fight later on in the year. 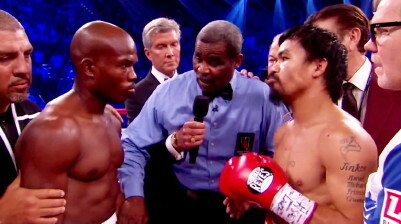 It doesn’t matter if Bradley loses to Pacquiao. Marquez wants the rematch against Bradley, so that’s a fight that Bradley will have in late 2014. As for the remaining time he has on his contract with Tp Rank, Bradley will be looking at additional rematches against Pacquiao before he starts fighting Arum’s other Top Rank stable fighters in Provodnikov, Brandon Rios, Mikey Garcia, Mike Alvarado and Terence Crawford. The likely only thing that will keep Bradley from fighting all of those fighters is if his contract runs out or if it’s terminated by Top Rank due to him losing too many fights. It’s too bad that Bradley extended his contract with Top Rank because it would have been interesting to see how Bradley would have done in fights against Floyd Mayweather Jr., Adrien Broner, Saul “Canelo” Alvarez, Danny Garcia and Lucias Matthysse. I suspect he would have lost to all of those guys, but it looks like we’ll not be seeing him fight any of those anytime soon. I don’t think most boxing fans agree with Arum that what what happened in the first fight was “yesterday’s news.” I believe a lot of boxing fans still feel that Bradley was given a decision he didn’t deserve over Pacquiao, and that it’s not worth paying to see Pacquiao beat Bradley a second time just because the judges messed up in giving the wrong guy the victory. Arum should discount the Pacquiao-Bradley II rematch steeply to reflect how boxing fans got ripped off the last time they saw the two fighters face each. Why ask fans to pay to see the same two guys fight again when the entire world pretty much saw Pacquiao getting robbed? Arum should make this a $5 fight rather than asking the public to pay over $60 to see them fight again.